No plans! Nothing we must do today! We luxuriate in the sense that there is nothing on our to-do list, and sleep late. It is surprising to me how seldom we’ve had this feeling of total freedom that we feel today. I thought that 1 ½ months into the trip, we’d have run out of things to do and would be looking for action. It is proving to be quite the opposite. Greg wrote yesterday that the apartment is too stark for his tastes. I haven’t decided yet if I agree – it is certainly visually stunning. My concern is that it may not be very practical, although after 2 days it is proving to be more practical that I had originally expected. 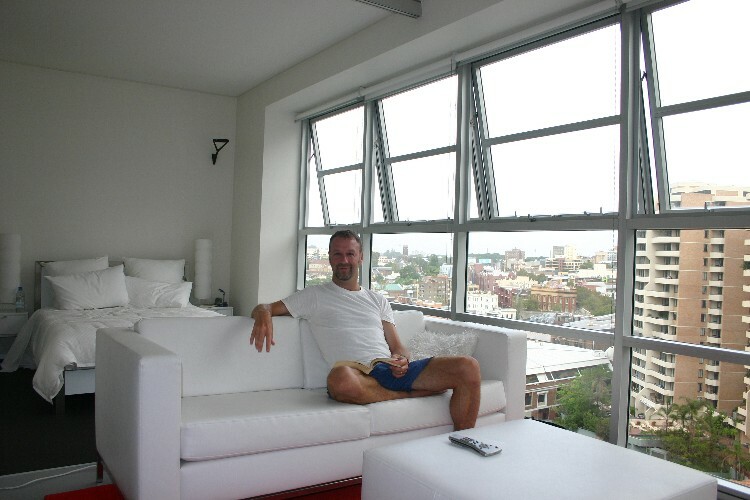 You walk in the door and the first thing that you see is the wall of glass – floor to ceiling, wall to wall – and the south-facing, 12th floor view over Darlinghurst and Surry Hills (unlike in the northern hemisphere, a south view here means that you don’t get direct sunlight, so the apartment stays relatively cool, a good thing given that it is not air-conditioned). The next thing you see is the whiteness – it is very white – the walls (no art), the ceiling, the dining room table, the chairs, the vases, the leather sofa and ottoman, the bed and the linens. The floor is neutral grey, and the only colour is the bright red carpet in the sitting area. Greg supplemented that yesterday with the flowers he gave me for my birthday – star lilies (and more white – tuberoses – the two scents together are beautiful). The bedroom is separated from the main part of the apartment by a frosted glass 3-panel door that pushes back into the wall to integrate the spaces if you wish. The bathroom is the only area that isn’t white – it is black tile, with white fixtures, and a sliding panel to separate it from the dressing room. We do a shop at the IGA that is across the street from the internet café, marvelling again at our luck in losing our first apartment and finding this one, far better located, at such short notice. Then it is back to the apartment for lunch and naps. At 4, I go to the apartment building’s gym – which turns out to be surprisingly well equipped – for a long-overdue workout, and to appease my guilt I do a triple workout – 2X my normal cardio of 40 minutes, and then my weights routine. I come back to the apartment to find that a chicken is roasting in the oven. I make a salad, and we wash it down with a lovely white wine – a blend of semillon, sauvignon blanc and viognier. We sit quietly after dinner – the dishwasher (the cutest – ½ size, perfect for 2 people, and absolutely silent) does its things while Greg reads and I write this. We will be loving our month in Sydney, living in white-style!